Mexicans are known for their kindness and hospitality, as well as for their festive spirit. They love to listen and dance to great music, love to enjoy life and celebrate holidays together. Mexican food is mostly nutritious and full of spices, and we can all picture jovial family and friend gatherings around tacos, quesadillas, guacamole, burritos, enchiladas, tamales, rice and beans. It is likely that your Mexican au pair will enjoy sharing recipes with you. In Mexico, punctuality is not as important as it is in the United States, but with that comes great flexibility! Mexicans mostly grow up in large families with traditional gender roles, in close proximity to extended family members. 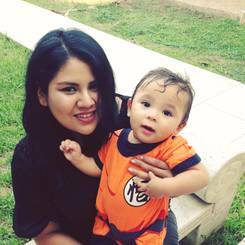 You can expect your Mexican au pair to be family-oriented, and to want to be a true part of your family. In return, your au pair will expect the same from you. Values of love, honesty, loyalty and unity are widely believed to be essential. Young people usually stay at home with their parents as much as possible, and sometimes go to live with extended family members when possible. Many Mexicans now pursue post-secondary studies. Most of the Mexican people are raised in a safe and fun environment as kids, playing outside the house is very common, activities and sports such as soccer, bike rides, going to the playground, or games. Mexican au pairs are likely to have gained child care experience watching siblings or relatives (cousins, nephews & nieces), or other children in the neighborhood. After completion of a written and a driving test a driving permit can be obtained with 16 years of age and a license with 18 years. However, many Mexican states allow passing the practical test by attending classes and do not request a practical test. Not all young people are used to drive on the regular basis, because many cities offer some kind of infrastructure. It is always recommended that you discuss your driving needs with your au pair. English is mandatory only from 7th to 9th grade in Mexico, although some schools have started an option to learn English earlier in the past few years. Most of the people, who possess a goof level of English, have achieved it through taking private classes on the side or after completion of their high school. I babysat Santiago (8mths) from November 2017 to April 2018 on weekday afternoons. I fed him, changed diapers, supported him in his development. I looked after Andres (7) and Adrian (11) from August 2017 to May 2018 on weekdays. I prepared meals and fed them and took them to and from school. I worked in a kindergarten from February to July 2017 five days a week taking care of children ages 3 months. Per a reference: "As a nurse, she's got the preparation in motor development, healing and taking care of babies. Her strongest qualities are her patience to children and will for helping others. She is responsible and organized."